It's All Connected: Reviving A Deck On The Cheap! After I finished working on the rental property redo, I planned on taking it easy. 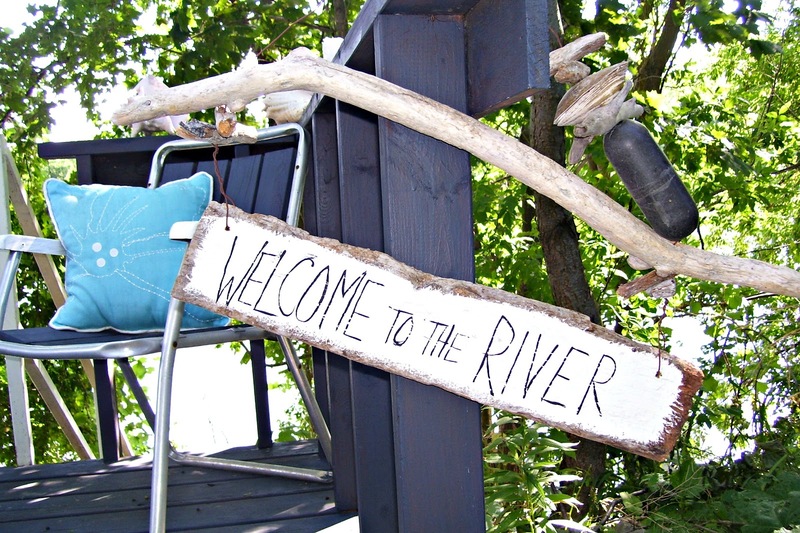 I wanted to sit by the river and let the world flow by. I did that for exactly two hours! As much as I like to have the river front look natural, my deck was an unsightly mess! 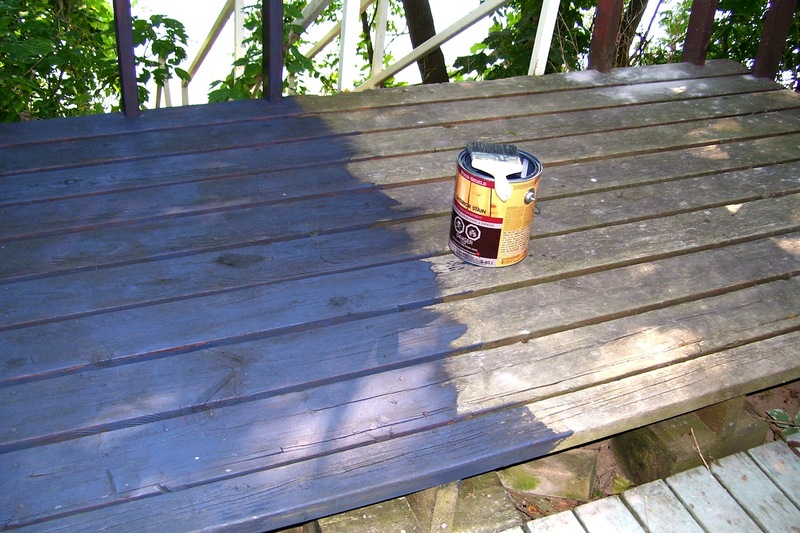 The old deck was stained brown and the other pieces were light blue. Sorry, I started to stain before I remembered to take a pic. 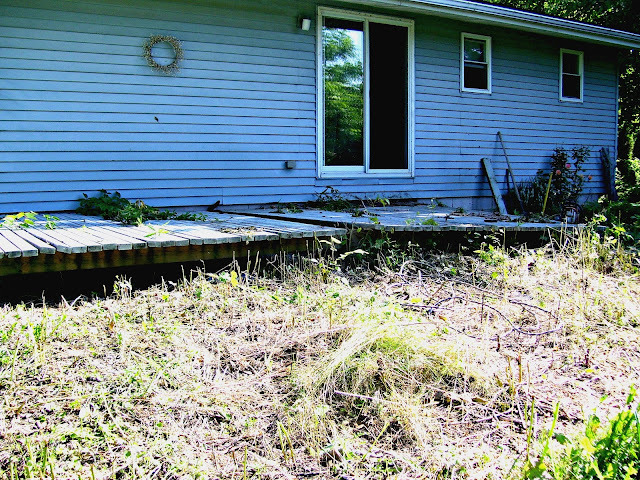 I think I only had about six readers when I wrote about the yard devastation, so you might want to catch up on that tale here. You should save all your good stories until you have at least a dozen readers! Now, I think I've mentioned a few hundred times that I'm a little skint for cash right now, so this spruce up has to be done on the cheap! 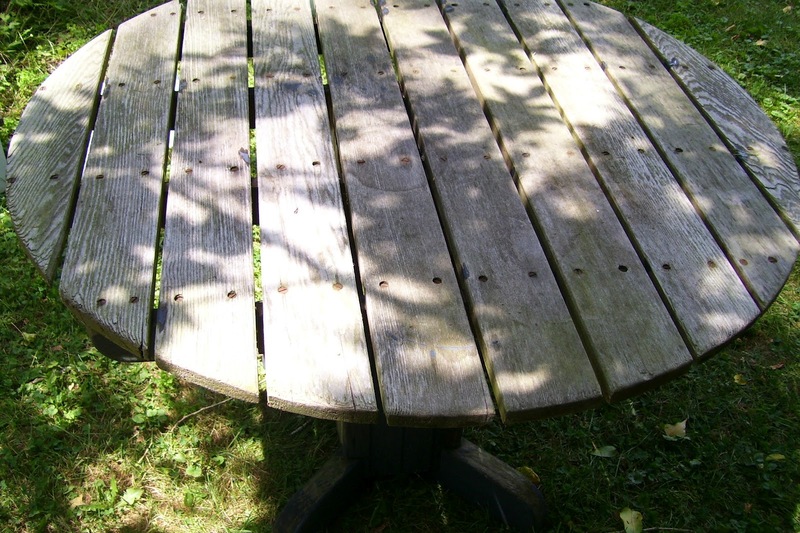 I paid two neighbouring teenage boys $70 to move all the pieces of deck together and level them out. I should have paid them danger pay for the nest of bees they uncovered! Oh, and the total cost with labour, materials and tent was under $200.00!!! Next comes the fun part - the decorating!!! Maureen what a transformation! The deck is looking good, I love the grey stain. 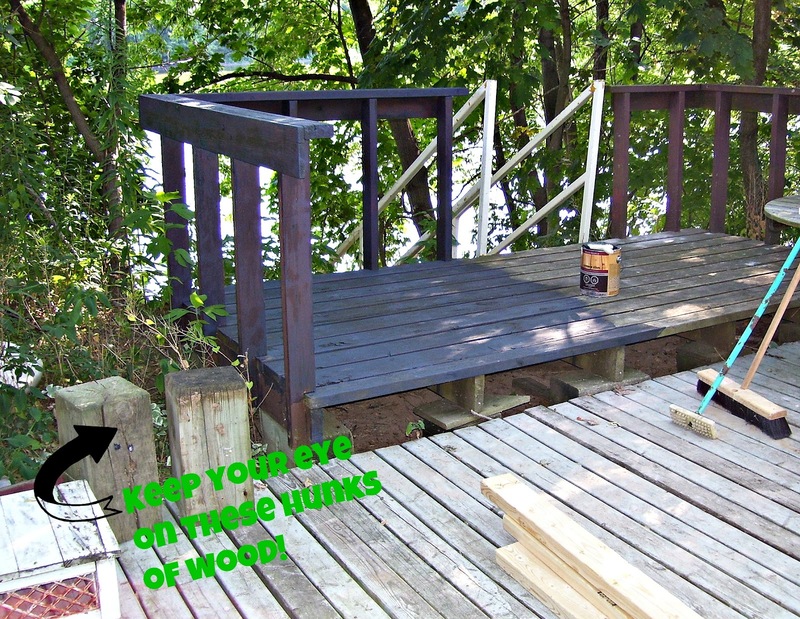 We are working on our deck as well (if and when it is not raining...which is never), thanks for the inspiration. Looks very inviting. Lots of hard work but hours of relaxing space ahead. Maureen that is one good-looking, well-deserved spot for relaxing! Funny that you couldn't rest more than 2 hours. I'm the same way once I get a plan in my head! How fun for you and your sister to work together and then get to relax together! I have an army of sisters and oh the things I could get done if I could just have them live closer!! Love the wharf-look and can't wait to see the decorating! I've been doing a little deck work here, but it's way too hot for staining or painting. whoa! a huge transformation! it looks absolutely fantastic. now go grab a glass of white wine, stretch out and admire your handiwork. Maureen, this is remarkable...it reminds me of a cabin in my long ago past that I took my children to in the summer...fond memories. I know you and your sister really enjoy your time here. Wow! what a fantastic job. I was wondering about the BM Mayonnaise paint...was it specially formulated for plastic? I have some similar chairs...and oh lands! they've seen better days. 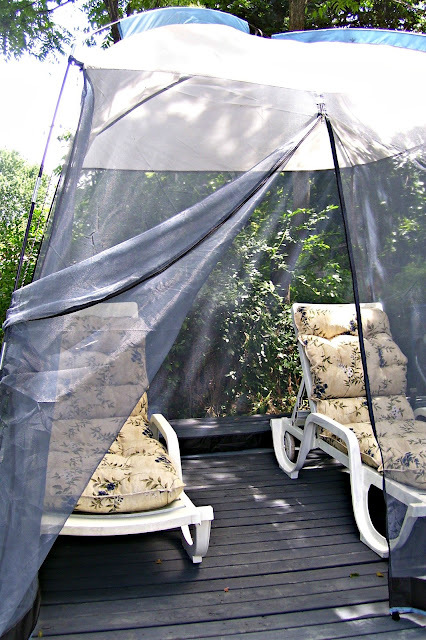 Your deck looks lovely and I love the screened in area... do the mosquitoes come in from the bottom? I'd like to screen in the back deck here, but was thinking I'd need to put plywood down...to keep them from coming underneath. Thanks for stopping by, Pat! 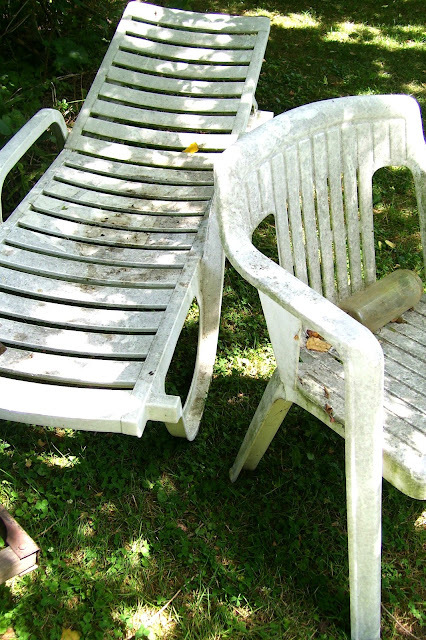 You can use any latex paint on plastic furniture. I've had it last a decade, left out in all weather, and it is fine. The furniture needs to be dull from weather for it to work, not shiny and new. It will scratch off if you stack them, but that seems to be all that will hurt it. Mosquitoes will come in the cracks of the deck and I'm working on a floor covering that will stop that. If you have access to your deck underneath, you can use a staple gun and put screening under to stop them. What a deck redo. It is looking very nice, and at such a reasonable price. 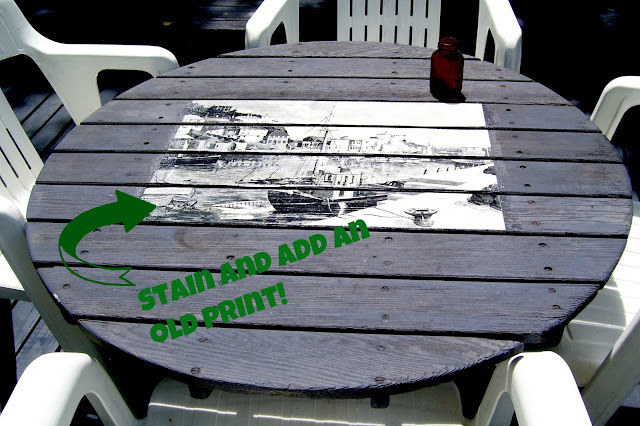 I love the stain color you chose. Hoping you will continue to enjoy it. 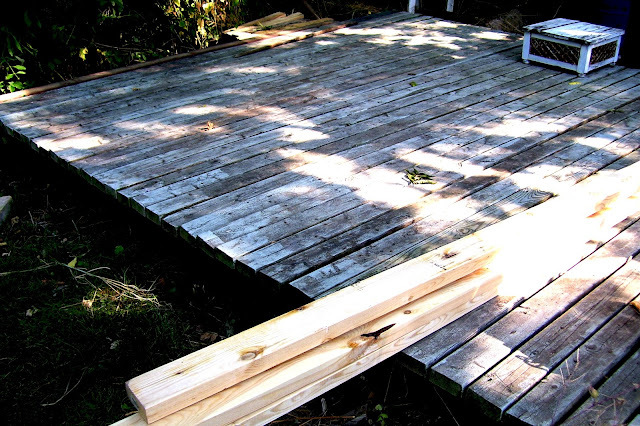 You did a great job redoing your deck. It looks wonderful and even better since you did it with such a thrifty budget! It looks amazing Maureen - it seems you're addicted to hard work, but it's certainly worth it, how great to be able to sit and relax by the river ! It looks so relaxing and amazing, and what a difference, when are we having drinks, LOL. Great work, I love it. have seen. Mr. Z. would love that because he hates bugs and mosquitoes. It looks like a wonderful spot to get away. I too hear you on the doing things on the cheap. About to start paying tuition for daughter #2 and this is always a strain. Life is so expensive these days. Thanks so much for linking up this week. Beautiful. You are a ball of fire. Photos are looking terrific.